The Continental Divide is the line that divides the flow of water between the Pacific Ocean and Atlantic Ocean in North America. Rain or snow that drains from the east side of the Continental Divide flows into the Atlantic Ocean while water on the west side flows into the Pacific Ocean. The Continental Divide, also called the “Great Divide”, winds through the New Mexico Gila like a snake in the bush. 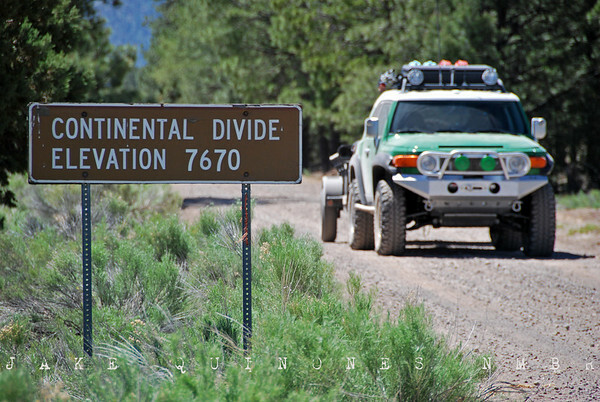 On this trip, we crossed the divide six times. While roadwork does not exist for extensive vehicle exploration, the Continental Divide Trail allows hikers an epic route across the backbone of America from Mexico to Canada. In New Mexico, the Continental Divide Trail follows an estimated 770 miles from the San Luis Mountains near Antelope Wells to the 12,778 Banded Peak north of Chama. Hikers should be aware that 194 miles of the the still need to be completed and are currently nothing more than a line on the map. As the Continental Divide Trail crosses many remote sections of the Chihuahuan Desert, hikers should be aware that water sources can be sparse.